NASA's Mars Reconnaissance Orbiter captured this image of Red Planet sand dunes and boulder piles on Jan. 27, 2018. 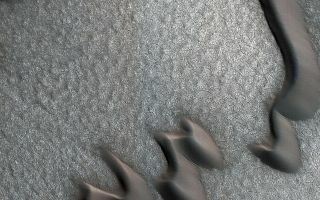 Sinuous Martian sand dunes take center stage in a newly released photo by a NASA spacecraft — but don't dismiss the speckly ground surrounding them. The photo, which was taken Jan. 27 by the High Resolution Imaging Science Experiment camera aboard NASA's Mars Reconnaissance Orbiter (MRO) shows parallel dark and light stripes arrayed from the upper left to the bottom right on the duneless ground. If you look closely, you can see boulders piled at regular intervals within the dark stripes — the possible signature of a phenomenon called "frost heave," NASA officials said. "With frost heave, [repeated] freezing and thawing of the ground can bring rocks to the surface and organize them into piles, stripes or even circles," NASA officials wrote in a description of the photo, which was released Tuesday (March 6). "On Earth, one of these temperature cycles takes a year, but on Mars it might be connected to changes in the planet's orbit around the sun that take much longer." The photo shows a patch of Mars' far north; it's centered at a latitude of 74.94 degrees north (and a longitude of 279.34 degrees east, in case you were wondering). Objects as small as 38 inches (96 centimeters) can be resolved, NASA officials said. That's quite a feat, considering that MRO was 200 miles (320 kilometers) above the planet at the time. The $720 million MRO mission launched in August 2005 and arrived at the Red Planet in March 2006. For the past dozen years, the orbiter has been doing a variety of work, from hunting for signs of past water activity on Mars, to scouting out landing sites for potential future missions, to relaying communications from surface craft, such as the Opportunity and Curiosity rovers, back to Earth.